A spoiled child, I was flabbergasted and a little furious when, at the age of 5, I was told I could not live in my mother’s basement when I grew up. For most of my childhood, I assumed my mother’s vehemence came from her dislike of housekeeping, and of the idea that she would have to pick up after my own spoiled children if we all lived in the basement. So then I resolved to live down the street, keeping with family tradition. My mother, and all her sisters, lived a hop, skip, and a jump from my grandmother, in what seemed like an unspoken rule of daughterhood. It seemed scandalous for my mother to encourage me to move far away from our Missouri hometown for college, seemingly shirking my familial obligation. Nothing seemed better than living out my life in Grain Valley, alongside the family I felt equally endeared and indebted to. Staying with my parents in perpetual girlhood sounded like paradise; leaving them, like a betrayal. It seemed an insult to my parents to even consider a life that was, somehow, superior enough to justify abandoning them. My mother’s insistence confused me to no end, even as I began to receive scholarship offers from out-of-state universities. I did not fully understand my mother’s urgings until I was 18 years old, in a rented car with her, somewhere between San Francisco and Los Angeles at 4 in the morning. 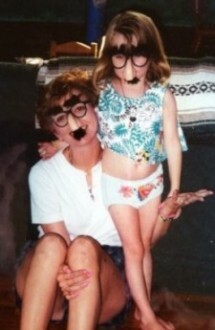 “I need to tell you something, Hattie, and I need to know you aren’t going to hate me,” my mother said out of the blue. We had spent the day touring colleges in Los Angeles, and had been driving for hours to spend the next day exploring Stanford and UC Berkeley. I wondered if my mother’s impending confession was some sort of car trouble that would strand us in the middle of an unfamiliar state. I encouraged her to go on. That’s when my mother told me about her first marriage. At the age of 20, my mom married her high school sweetheart. He did not treat her kindly. He was abusive. One day, she packed a suitcase while her husband was out, left a full dinner on the table, and never set foot in their apartment again. They were divorced soon after, and within the year she would meet my future father. Her second husband, I thought to myself in disbelief. In my mind, a dozen stray puzzle pieces slipped into place. My mother’s astounding work ethic had sprouted from necessity, and from fear. Her goofy anecdotes of young adulthood were always edited around a decade-long relationship she wasn’t ready to tell me about. And my mother’s insistence that I not hunker down in her basement reflected her worry that the promises I made when I was young would keep me from experiencing the world as an adult. Indeed, I was and am not my mother: I laughed in my high school boyfriend’s face when he suggested I tailor my college decision to his preference. And I could see now that, throughout high school, I was paving the way to live wherever I wanted and attend whichever university I liked. The world was my oyster. And suddenly I understood that at 18, the world had been at my mother’s feet, too, but she had made other promises. When my mother remarried, she was able to take on one dream she’d held close to her heart for a long time: having children. Throughout my youth, my mother told me and my younger brother that our joy would always be her top priority, and that being our mom was her number one job. As I’ve grown up, I have come to understand how my dreams have also become my mother’s. The day I was born, my mom told me, she felt she had everything. And since, she’s dedicated herself to making sure I would feel the same way someday, even though it meant her heart would break. When my mother sent me out into the world, she knew she’d never quite get the same daughter back. Once I had a taste of independence, and of success, a rift would form between us: the fate of mothers and their daughters who leave. I’ve come to see since that my mother is more isolated now than I was when I first turned up in Phoenix, a small city of millions of strangers. My mother bears the burden of my younger brother’s sadness and frustration at the absence of his older sibling. She witnesses my father’s fear for my safety and my grandmother’s fretting. I wonder if my aunts and uncles ask my mother why I don’t make the effort to come home more. When I was a child, my mother gave up friendships to spend time with me, and now she gives me lighthearted briefings on failed lunch plans and dud “girl dates.” She’s open about her sadness—she tells me when she has “sorrow for dinner,” or when she’s cried herself to sleep. I am, perhaps, the only person who understands her heartache, because I gave it to her. I watch my mother’s grief from afar, like watching a possible version of my future self in a crystal ball. I know that one day, I will send my own children into the world, and it will be hard. But my mother has prepared me. I will understand when my children don’t want to come home during holidays, and when they come home with newly acquired beliefs I can’t understand, I’ll remember the way I argued with my parents during my first collegiate summer home. Or, better yet, I will turn to my mother for advice. I have, at 21, more freedom than I know what to do with. And as I get older, that feeling will only grow; my mother has created a trust fund of the liberties she missed out on. In chasing my own dreams, I’m fulfilling hers, too. If at 18, I’d decided that living in my mother’s basement was truly the life I wanted, my mom would’ve furnished it for me. But that’s not how it happened. Instead, my mother taught me unconditional love by encouraging me to break her heart. My mother wouldn’t let me make promises to her, so instead, I call her once a week and tell her about the promises I’m making to myself. Hattie Hayes is a comedian and writer. She hosts a weekly variety show in Phoenix, Arizona, and will graduate from the Walter Cronkite School of Journalism at Arizona State University in May 2017. *Photos courtesy of Hattie Hayes.